Severe cases of kennel cough are highly contagious and can result in life-threatening respiratory compromise. Dr. Nafe provides detailed discussion from risk factors for—to treatment of this disease complex, including managing critically ill dogs. Bordetella bronchiseptica and canine influenza virus (CIV) are common causes of infectious tracheobronchitis and, occasionally, pneumonia. Combined, these and other pathogens cause the canine infectious respiratory disease complex (CIRDC), often referred to as kennel cough or infectious tracheobronchitis. The multitude of bacterial and viral organisms associated with CIRDC are listed in Table 1. In general, morbidity for CIRDC is high with mortality being low. Severe cases can result in life-threatening respiratory compromise due to pneumonia. Disease Spectrum. The spectrum of disease that results from infection with B bronchiseptica is wide, with some dogs manifesting mild disease characterized by nasal discharge and intermittent cough and others developing severe pneumonia that can be life threatening. Prevalence. The prevalence of serum antibodies against CIV in dogs with no clinical signs of respiratory disease has been shown to be 0.5% to 3%, depending on the risk of the population being evaluated (Figure 1).6 Note that a positive antibody titer in a population of dogs with no signs of respiratory disease likely indicates prior exposure to the virus, rather than active infection. In shelter dogs with signs of respiratory disease, seroprevalence is as high as 50%, depending on length of time since intake to the shelter.7,8 Given the population, these patients are likely co-infected with other common viral and bacterial pathogens that encompass the CIRDC (Table 1). However, veterinarians should recognize that the prevalence of CIV is much lower in client-owned dogs with respiratory signs, especially if they have not been recently exposed in a shelter or boarding kennel. Considering modes of transmission and environmental survival of the agent is important when discussing management of patients in hospital. Clinicians should take precautions when handling these patients and make efforts to limit exposure throughout the hospital. Hospitalize patients in isolation facilities within the clinic to limit exposure to other dogs, especially those that are immunocompromised. As much as possible, manage infected patients as outpatients. Ensure that staff wear protective clothing, such as gloves and disposable gowns, when working with infectious patients. Keep the veterinary team from handling other patients of the same species during the same shift in which they have handled infectious patients. Limit contact between critical patients that require oxygen therapy and close monitoring—who are not candidates for an isolation area—and other patients in the critical care unit. Implement precautions to limit fomite contamination. An in-depth review of preventing CIV in the hospital setting is presented in the article Is Your Practice Proactive or Reactive? (January/February 2012), available at tvpjournal.com (Article Library). Immune dysfunction due to concurrent infections (viral, bacterial, parasitic). Because puppies housed in shelters and pet shops are often in closed ventilation spaces with other puppies from various environments, they are at highest risk. Vaccination can help protect against infection and reduce severity of clinical disease. Read Dr. Richard Ford’s article, Kennel Cough Revisited, for a discussion on current advances in vaccination for canine respiratory disease. Inhalation of aerosolized microdroplets of respiratory secretions. In high-density housing situations, direct contact among dogs is most common. Less commonly, fomites serve as a source of transmission. Most viruses begin shedding within 2 days post infection, and may continue to shed for 6 to 10 days before viral load decreases.5 B bronchiseptica can survive in the environment for extended periods of time,1 and can be shed from dogs that appear healthy because it has the ability to elude the immune system for weeks to months. Tachypnea, respiratory distress, systemic illness, and fever (more severe cases). Thoracic radiographs may support a diagnosis of B bronchiseptica or CIV (Table 2) but, more important, help to rule out other causes of acute cough. Signs of systemic illness (eg, lethargy, decreased appetite). In more severe cases, radiographs are necessary to evaluate if pneumonia is present. Thoracic radiographs are not typically indicated in otherwise healthy patients with acute onset of only coughing (no signs of respiratory distress, tachypnea, fever, or systemic illness). In complicated cases, a complete blood count and serum biochemical profile should be performed to assess systemic health, but these diagnostics are not generally necessary for diagnosis of B bronchiseptica or CIV. Definitive diagnosis of B bronchiseptica is based on isolation of the pathogen from aerobic culture of respiratory secretions. Bronchoalveolar lavage (blind or bronchoscopy-guided). Patients with unresponsive focal pneumonia may require bronchoscopy-guided bronchoalveolar lavage fluid collection to obtain a sample that accurately represents the causative pathogen. Mycoplasma species cannot be seen on cytology and are difficult to culture; consider submitting a mycoplasma polymerase chain reaction (PCR) or mycoplasma culture, when indicated. Sample Preparation. Following collection of an airway sample, cytology should be performed as quickly as possible (ideally within hours) to reduce disruption of the cells.11,12Because many samples are fairly low in cellularity, a concentrated population of representative cells can be evaluated by a cytospin or line smear preparation or manual smearing of pelleted cells. Sample Evaluation. Evaluate the sample for the differential cell count and presence of bacteria or other infectious organisms. B bronchiseptica has a characteristic cytologic appearance, with the coccobacilli adhering to respiratory epithelial cells (Figure 3). Concerns about previous exposure clouding results of serologic testing. Antimicrobial therapy can be important in patients with suspected B bronchiseptica infections or, if CIV or another viral respiratory pathogen is suspected, to treat secondary bacterial infections. Doxycycline (5 mg/kg PO Q 12 H or 10 mg/kg PO Q 24 H) is my treatment of choice for B bronchiseptica and most infectious respiratory diseases. Doxycycline Resistance. Some isolates of B bronchiseptica are doxycycline-resistant, and patients may require treatment with a fluoroquinolone (enrofloxacin or marbofloxacin), azithromycin, or chloramphenicol; however, management of these patients should ideally be based on culture and susceptibility of airway samples. Dosing for treatment of bordetellosis is currently unknown; recommended treatment of methicillin-resistant staphylococcal infections is 5 mg/kg PO Q 12 H or 10 mg/kg PO Q 24 H.
Increase in respiratory effort, even if the patient is oxygenating appropriately. Common methods of oxygen supplementation in hospital include oxygen cage, tent, nasal cannula(s), and nasal prongs. 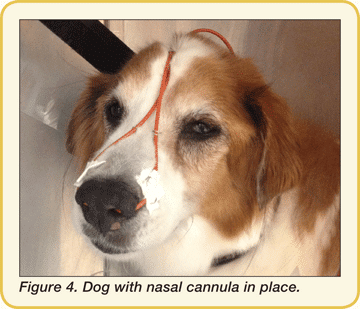 Nasal cannula or prongs may work best for highly contagious patients that must be isolated, but require supervision to ensure the catheter does not become dislodged (Figure 4). Critical patients often lose fluids through the respiratory tract, especially if they are febrile, leading to increased viscosity of secretions and reduced ciliary clearance. Initiate IV fluids to replace fluids lost and improve clearance of respiratory secretions. Nebulization with sterile saline (6–10 mL) results in a liquid particulate suspension that improves clearance of tracheal and bronchial secretions. Nebulization followed by coupage may be performed for 15 to 20 minutes every 4 to 8 hours in hospitalized patients; owners may rent or purchase a handheld jet nebulizer for use at home. Antibiotic therapy is essentially the same for all patients (see ANTIMICROBIAL THERAPY); however, injectable antibiotics should be considered for critically ill patients, due to associated gastrointestinal upset and poor bioavailability of oral antibiotics in anorexic patients. Fluoroquinolones (enrofloxacin, ciprofloxacin) may be preferred for injection because, compared to doxycycline, they provide more broad spectrum coverage for gram-negative organisms, are unlikely to result in phlebitis, and are less expensive. Anti-inflammatory glucocorticoids and/or cough suppressants may be indicated for patients with infectious tracheobronchitis or suspected tracheitis secondary to frequent coughing. Ensure the patient has no evidence of pneumonia and is otherwise systemically healthy before intervening with these therapies. Most patients with CIRDC do not require these therapies, and I do not recommend using oral/inhaled corticosteroids or cough suppressants in patients with moderate to severe B bronchiseptica infection or CIV, especially if pneumonia has developed. Cough suppressants, in particular, are contraindicated in patients with bronchopneumonia, as suppression of cough can prevent clearance of bacteria, worsen disease, and/or delay recovery. If considering use of a bronchodilator in a patient with CIRDC, I prefer methlyxanthines due to their other potentially beneficial effects, including anti-inflammatory properties, improved mucociliary clearance, and improved diaphragmatic contractility.17 Unlike cats and humans, dogs do not develop true smooth muscle bronchoconstriction, and therefore, beta-2-agonists are not useful in the management of canine respiratory disease. In my opinion, bronchodilator therapy, while extremely important in management of feline lower airway disease, has limited value in canine respiratory disease and may have undesirable adverse effects (cardiac, gastrointestinal). Therefore, I do not recommend bronchodilators for treatment of infectious tracheobronchitis or pneumonia caused by B bronchiseptica or CIV. Aerosolized or oral expectorant or mucolytic therapy is often instituted in cases of canine respiratory diseases that result in excessive tracheal and/or bronchial secretions. Nebulized N-acetylcysteine can be irritating and result in bronchospasm, further worsening tracheobronchitis and coughing. Guaifenesin, an expectorant often paired with a cough suppressant, has no scientific or anecdotal (that I have observed) evidence supporting its use in patients with B bronchiseptica or CIV. The safety and efficacy of specific antiviral agents, such as neuroaminidase inhibitors (eg, oseltamivir phosphate, zanaminir) has not been evaluated in dogs.1 Therefore, these agentscannot be recommended for dogs with CIV or other respiratory viral diseases. There are anecdotal reports promoting administration of the intranasal B bronchiseptica vaccine in dogs with CIRDC. However, to date, there are no controlled studies that support its use as a “therapeutic” intervention in dogs with B bronchiseptica infection or CIV and, in critical patients with this infection or virus, intranasal vaccine administration may worsen the course of disease because the immune system is already compromised, and an immune response places additional stress on the system. Ford RB. Canine infectious tracheobronchitis. In Greene CE (ed): Infectious Diseases of the Dog and Cat, 4th ed. St. Louis: Saunders, 2012, pp. 55-65. Priestnall SL, Mitchell JA, Walker CA, et al. 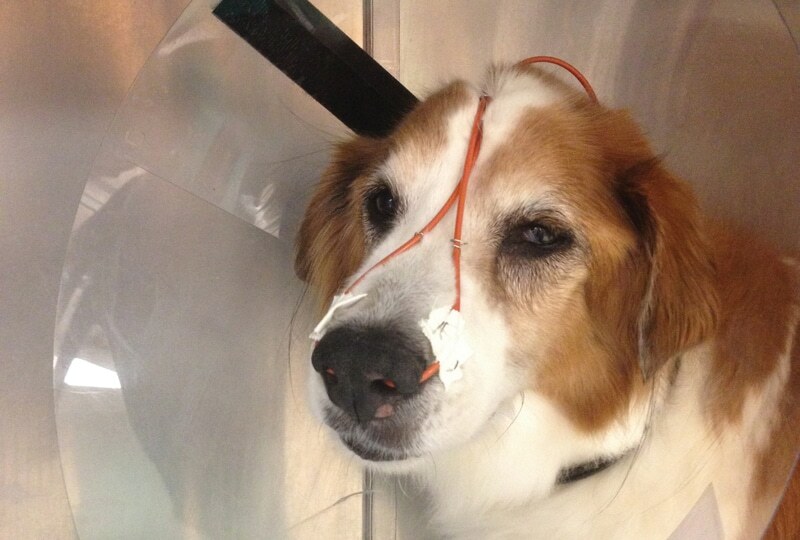 New and emerging pathogens in canine infectious respiratory disease. Vet Pathol 2013 [Epub ahead of print]. Mattoo S, Cherry JD. Molecular pathogenesis, epidemiology, and clinical manifestation of respiratory infections due to Bordetella pertussis and other Bordetella subspecies. Clin Microbiol Rev 2005; 18:326-382. Anderton TI, Maskell DJ, Preston A. Ciliostasis is a key early event during colonization of canine tracheal tissue by Bordetella bronchiseptica. Microbiol 2004; 150:2843-2855. Crawford PC, Dubovi EJ, Castleman WL, et al. Transmission of equine influenza virus to dogs. Science 2005; 310:482-485. Serra VF, Stanzani G, Smith G, et al. Point seroprevelence of canine influenza virus H3N8 in dogs participating in a flyball tournament in Pennsylvania. JAVMA 2011; 238:726-730. Anderson TC, Crawford PC, Dubovi EJ, et al. 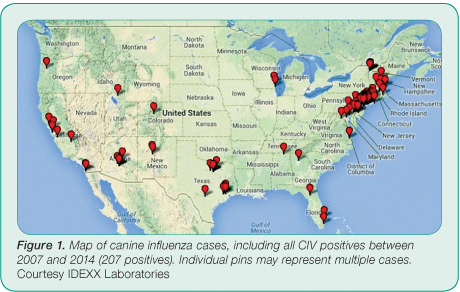 Prevalence of and exposure factors for seropositivity to H3N8 canine influenza virus in dogs with influenza-like illness in the United States. JAVMA 2013; 242:209-216. Holt DE, Mover MR, Brown DC. Serologic prevalence of antibodies against canine influenza virus (H3N8) in dogs in a metropolitan animal shelter. JAVMA 2010; 237:71-73. Radhakrishnan A, Drobatz KJ, Culp WT, et al. Community-acquired infectious pneumonia in puppies: 65 cases (1993-2002). JAVMA 2007; 230:1493-1497. Sumner CM, Rozanski EA, Sharp CR, et al. The use of deep oral swabs as a surrogate for transoral tracheal wash to obtain bacterial cultures in dogs with pneumonia. J Vet Emerg Crit Care 2011; 21:515-520. Dehard S, Bernaerts F, Peeters D, et al. 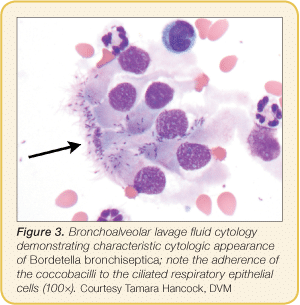 Comparison of bronchoalveolar lavage cytospins and smears in dogs and cats. JAAHA 2008; 44:285-294. Nafe LA, DeClue AE, Reinero CR. Storage alters feline bronchoalveolar lavage fluid cytological analysis. J Feline Med Surg 2011; 13:94-100. Anderson TC, Crawford PC, Katz JM, et al. Diagnostic performance of the canine influenza A virus subtype H3N8 hemagglutination inhibition assay. J Vet Diagn Invest 2012; 24:499-508. Pecoraro HL, Spindel ME, Bennett S, et al. Evaluation of virus isolation, one-step real-time reverse transcription polymerase chain reaction assay, and two rapid influenza diagnostic tests for detecting canine Influenza A virus H3N8 shedding in dogs. J Vet Diagn Invest 2013; 25:402-406. Maaland MG, Guardabassi L, Papich MG. Minocycline pharmacokinetics and pharmacodynamics in dogs: Dosage recommendations for treatment of methicillin-resistant Staphylococcus pseudintermedius infections. Vet Dermatol 2014; 25:182-190. Lim S, Hossain MA, Park J, et al. The effects of enrofloxacin on canine tendon cells and chondrocytes proliferation in vitro. Vet Res Commun 2008; 32:243-253. Jagers JV, Hawes HG, Easton PA. Aminophylline increases ventilation and diaphragm contractility in awake canines. Respir Physiol Neurobiol 2009; 167:273-280. Laura A. Nafe, DVM, MS, Diplomate ACVIM (Small Animal Internal Medicine), is a clinical instructor in small animal internal medicine at University of Wisconsin SVM–Madison. She received her DVM from University of Missouri then completed an internship in small animal medicine and surgery at North Carolina State University, before completing a residency in small animal internal medicine at University of Missouri.